Capocolla pizza topped with caponata, honey, and hazelnuts. So return to Italy he did, studying under a chef whose family has been making pizzas for 100 years. The Shrewsbury resident then took his learnings and opened Volturno — named for a river that runs through the region of southwestern Italy of which Naples is the capital — in Worcester in 2013. The second location opened in Framingham in late September. THE LOCALE Califano converted a real estate office on Edgell Road just off Route 9 west into a sleek 100-seat restaurant with bar. “I wanted to do something local and family-oriented, with more of a small mom-and-pop vibe. I thought people in Framingham would appreciate that,” Califano said. The restaurant’s visibility and proximity to Framingham State University and Jack’s Abby (whose brews are incorporated into a bar menu that has 20 beers on tap, as well as affordable Italian wines and cocktails), are further plusses, he said. ON THE MENU To prepare the restaurant’s signature 12-inch pizzas, the kitchen uses a wood-burning oven imported from Italy that can hold five pizzas at a time and operates at a temperature as high as 900 degrees. The kitchen’s goal, according to Califano, is to get a pizza into the oven and then onto the plate within 90 seconds. What denotes a finished pie? A light, airy crust with “black blisters” of char imparted by the wood-firing process, Califano said. On the menu, there’s a pizza for nearly every taste. We sampled burrata ($18), the indulgent, namesake round of cream-filled mozzarella placed squarely in the middle of the pie, nestled among a generous tangle of fresh arugula, radicchio and taggiasca olives, and drizzled with basil oil. We were also drawn to the vongole ($17), strewn with briny, freshly shucked littleneck clams and crispy prosciutto atop a garlicky mozzarella base; a whip of cloud-like, lemon-infused ricotta is the fanciful final touch. 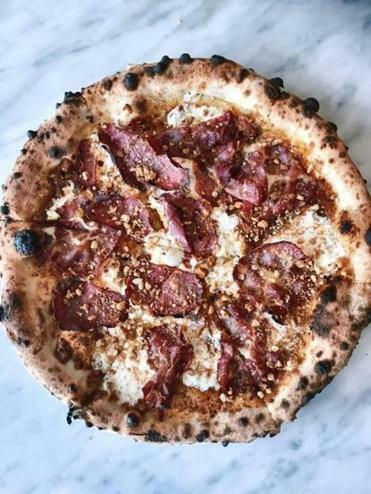 Other pizza temptations include the capocolla ($18) with spicy sausage, caponata paste, honey, hazelnuts and mozzarella; and the bianca ($17), which plops a fried egg atop a bed of mozzarella, ricotta, garlic confit, and caramelized onions. Volturno’s offerings extend well beyond the wood-fired pies. All of the pastas (except for the gluten-free varieties) are prepared in-house on an 8-foot-long table in the dining room. There’s a tagliatelle bolognese ($18), with beef, pork, veal, and buffalo combined into a hearty ragu with whipped ricotta. Another popular dish is pappardelle verde ($21), wider noodles with green parsley specks tossed with rock shrimp and guanciale. Chicken, salmon, and braised short rib dishes round out the entrees. Volturno is at 1 Edgell Road in Framingham, 508-875-7105, www.volturnopizza.com. Daily, 11:30 a.m. to 3 p.m. and 5:30 to 10 p.m.